Whether you are hosting the entire family for Thanksgiving dinner or planning an intimate meal for you and your loved one, you will want to create a beautiful setting for the celebration. Thanksgiving centerpiece decorations can be simple and homemade, or consist of elaborate cornucopias filled with seasonal flowers and fruit. Match the scale of the décor to the size of the table. A long, wide table will need more substantial centerpieces than a smaller, square table. 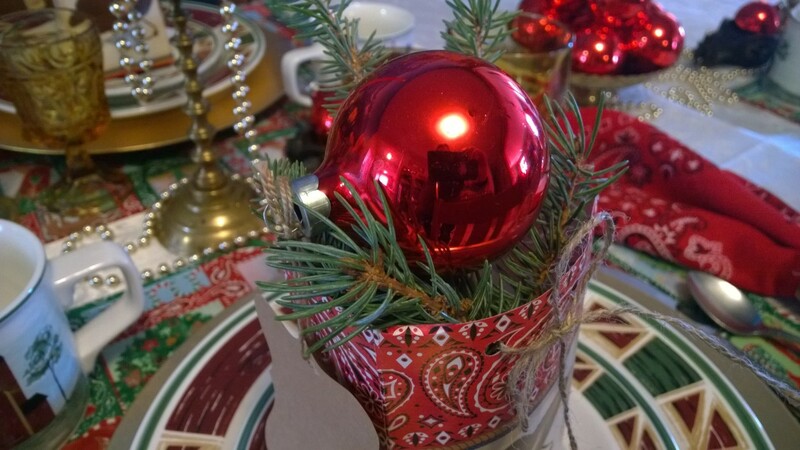 Conversely, you don't want to take up the entire table top with decorations! Fragrance-free is the way to go. While lilies are beautiful flowers, their heady scent may compete with the delicious aromas of the meal you have worked hard to prepare. 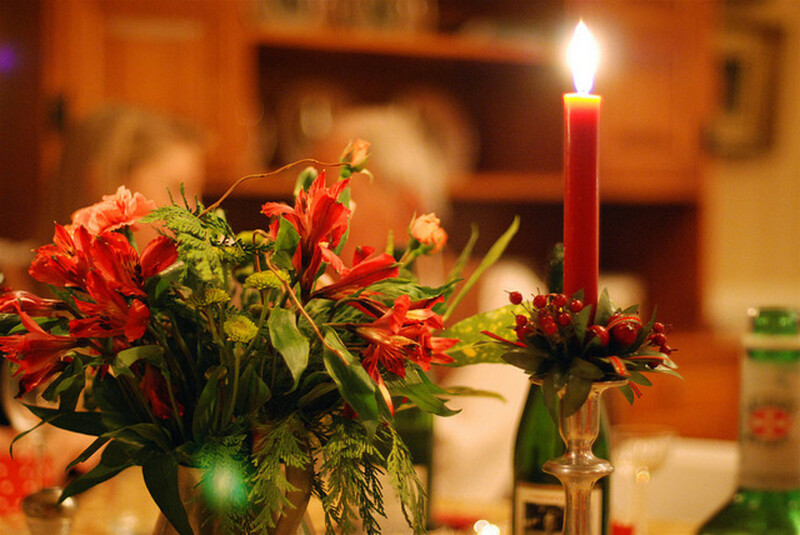 Likewise, choose unscented candles for your centerpiece. If you are hosting a large group for Thanksgiving, you probably have a big table to decorate. Large Thanksgiving centerpiece decorations can consist of a single, focal point on the table, or several smaller centerpieces grouped along the mid-line of the table. 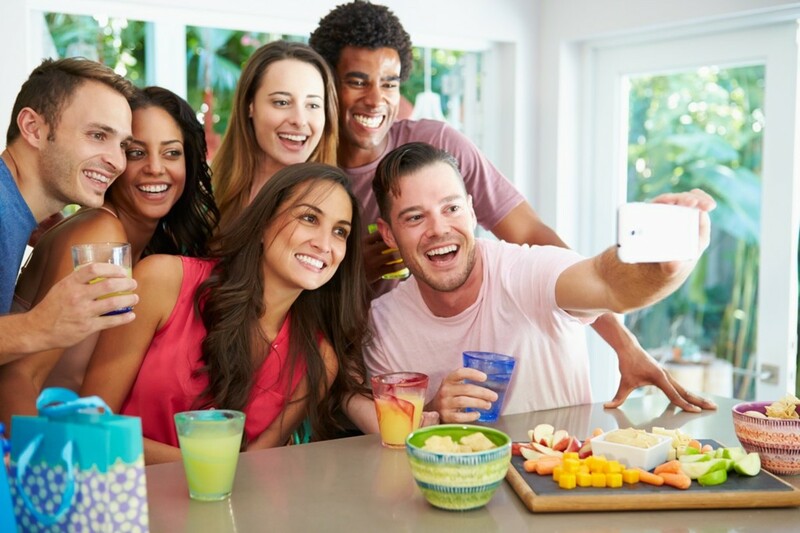 Be sure to leave room for food, plenty of elbow room and consider your guests' line of sight to keep conversation flowing. 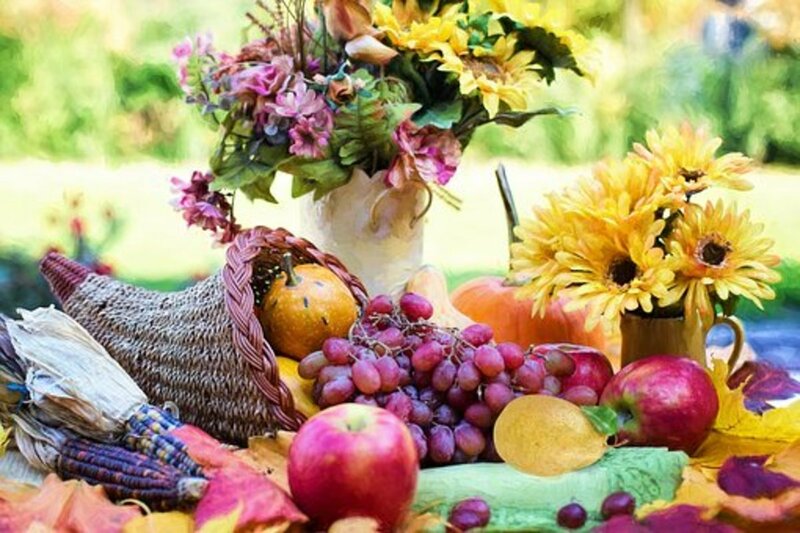 One of the most popular Thanksgiving centerpieces is the cornucopia, or "horn of plenty." This traditional decoration usually consists of a wicker horn-shaped basket, laid on its side, with seasonal fruits flowing out of it, onto the table. Choose a variety of sizes, shapes and colors for your cornucopia filling, including apples, grapes, small pumpkins, pomegranates, gourds, zucchini and more! To change the look of a cornucopia, consider painting the basket with spray paint, or adorning it with seasonal ribbons. 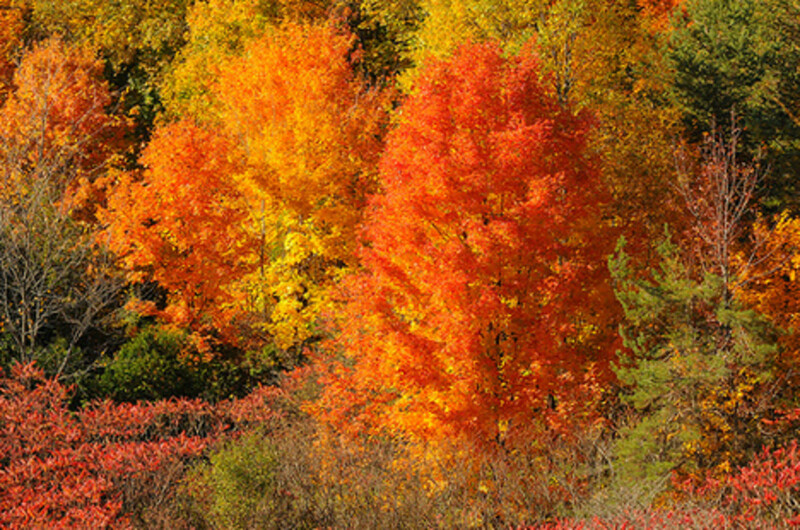 Bright fall foliage can also be mixed in with the fruit. 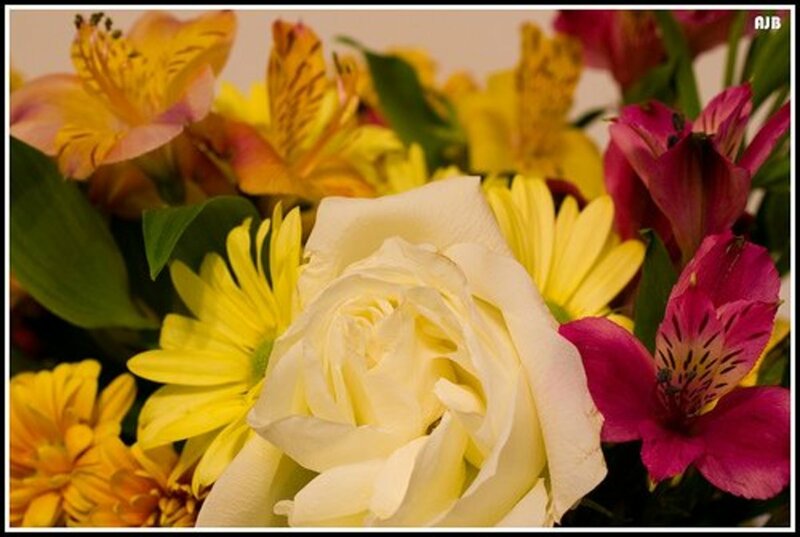 Its hard to go wrong with floral arrangements for holiday centerpieces. If you order flowers, talk to your florist about desired colors for the centerpiece and ask that overly fragrant blooms not be used. Centerpiece decorations are usually created in a long, low arrangement. Often, you can bring in a favorite vase or bowl from home that the florist will fill at no extra cost. While Thanksgiving isn't the busiest time of year for florists, do make sure that you place your order with plenty of time to ensure that your arrangements turns out as desired. Another popular and easy-to-create idea is using glass hurricane candle containers, candles, and your choice of fillings: (1) hazelnuts in their shells, (2) fresh whole cranberries, (3) glass beads (clear or amber colored), or, for the young at heart, (4) candy corn. For a large dining room table, use at least 4-5 hurricane containers in various sizes, grouped in the center. Festive Thanksgiving craft ribbon can be tied around the containers, as well. Add interest by grouping small votive candles in similarly colored containers around the edges of the arrangement, fall leaves and small pumpkins or other gourds. 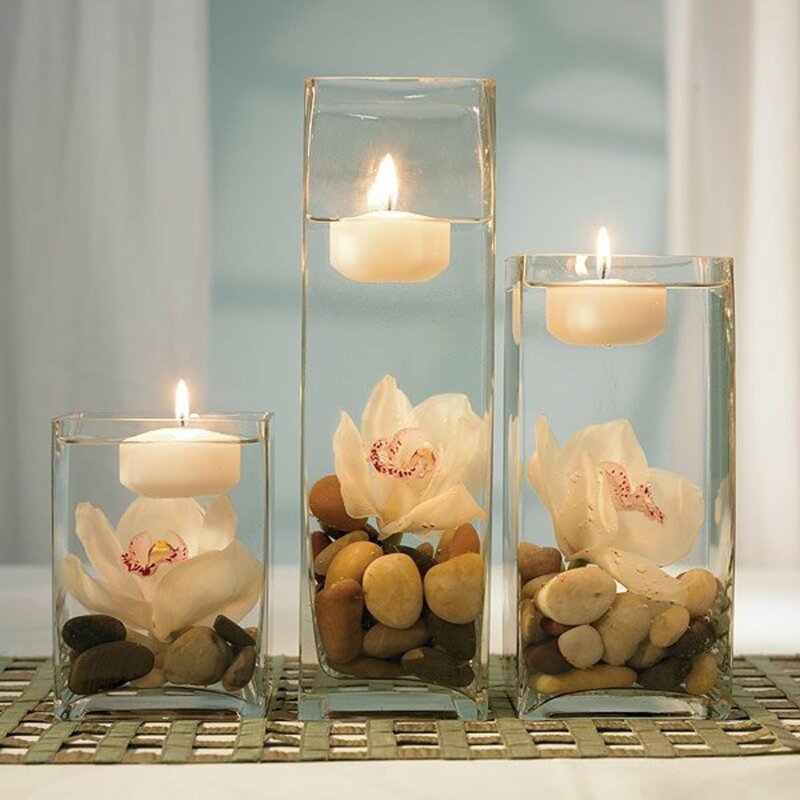 You can make this centerpiece even more impressive and dramatic by using 20-30 containers and candles, grouped along the mid-line of the table. If your celebration is going to be more intimate or if you simply are going to set additional smaller tables to accommodate your guests, consider these small decorations for tables seating 4 or less. The key here is to keep the centerpiece small so it doesn't overwhelm the table or detract from the intimacy of the setting. Among my favorite centerpiece ideas is placing a ceramic pumpkin in the middle of the table and using fall leaves and small votive candles around it. You can also use a real pumpkin, hollowed out, with a small vase inside to hold flowers (watch the video above). I love this idea from Tip Junkie that takes wine glasses, placed upside down over a mini pumpkin, topped with votive candles on the base of the glass, which faces up (see image right). Arrange the wine glasses on a flat tray surface. 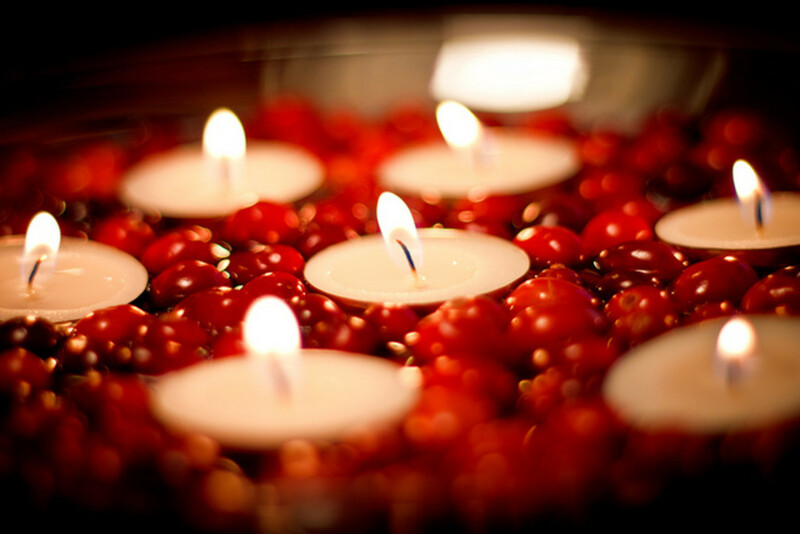 As shown in the photograph below, why not nestle small votive candles in a shallow bowl of cranberries for a modest, yet beautiful centerpiece? Of course, the hurricane candle container idea discussed above works equally well for small tables, provided you scale down the size of the candle and container accordingly. 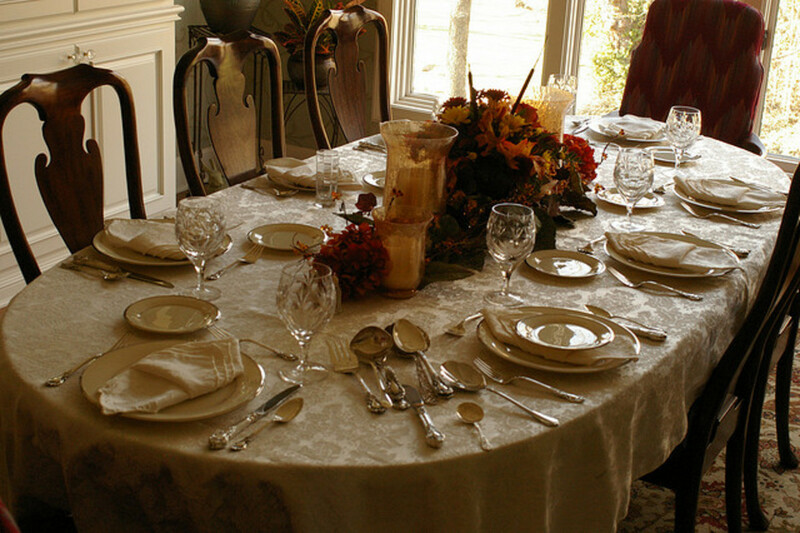 When setting a kids' table for Thanksgiving, choose nonflammable, unbreakable items. This means staying away from candles and breakable vases or bowls. Oranges with cloves. Select firm, ripe oranges and insert the "stick" part of whole cloves into the orange peel. Children can make designs with the cloves, if desired. Place the finished oranges in a bowl and position in the center of the table. Be sure to wash hands after this project because rubbing your eyes with clove dust can be irritating! Painted pumpkins. Set up a craft table with small pumpkins or other gourds and washable, non-toxic paints and paint brushes. You'll probably want to have a few large grown-up t-shirts to put on over the children's holiday clothes. Have the kids paint the pumpkins and allow at least 30 minutes to dry before putting them on the table. Turkey Breadbasket. The one thing you know kids will eat on Thanksgiving is bread! Make the breadbasket shown to the right for a centerpiece, using a woven basket, wooden spoon, construction paper, thin wood skewers and glue sticks. First, decorate the back of the spoon as the turkey's head, using pens or construction paper (googly eyes can be glued on, as well). Then create "feathers" with construction paper. On the inside of each "feather" apply glue and sandwich a wooden skewer between two "feathers." Put dry floral foam in the front and back of the basket, insert the head on one end and the feathers on the other and cover with a cloth napkin. Fill with bread or rolls! 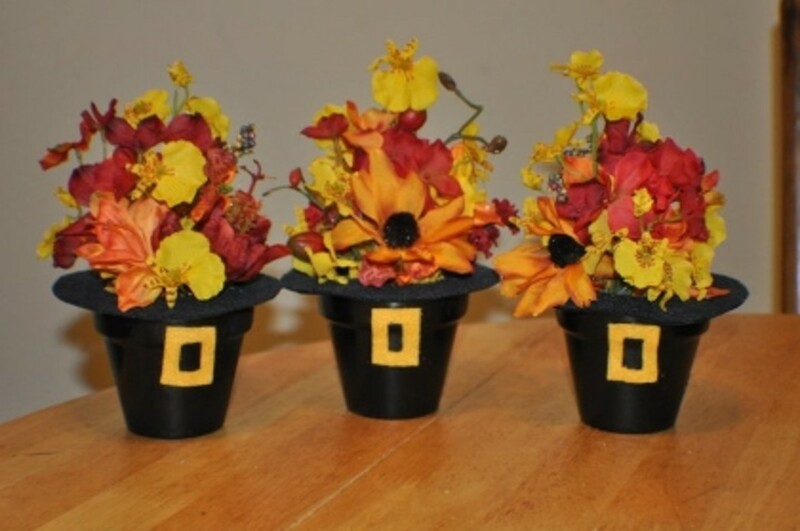 If you prefer to have the kids table already set and ready for Thanksgiving (without the mess and hassle of a craft), my favorite decorations for the younger set is the Pilgrim Hat Centerpiece shown below. Create these fun flower pots with Terra cotta pots, black spray paint, a hot glue gun, black cardstock and black and gold felt. Paint the pots black and allow to dry. Cut a circle out of black card stock that is about 2" larger than the top of the pot. From that circle, cut a smaller circle within to allow room for flowers. Cover the circle with black felt and glue to the top of the pot. Cut square "buckles" out of gold felt and glue to the front of the pot. Fill with flowers and enjoy! Don't Stress About the Centerpiece! If you're hosting Thanksgiving dinner at your home this year, remember that your table is going to be beautiful no matter how it is decorated. Bringing family and friends together for a shared meal and giving thanks for the blessings in our lives, no matter how big or small, is the purpose of the holiday. Keep that in mind, relax, and enjoy the company! This was a great Hub to come across, especially since Thanksgiving is just a few weeks away. Thanks for posting it. I enjoy to dress up my table for any occasion, it makes it look so festive. 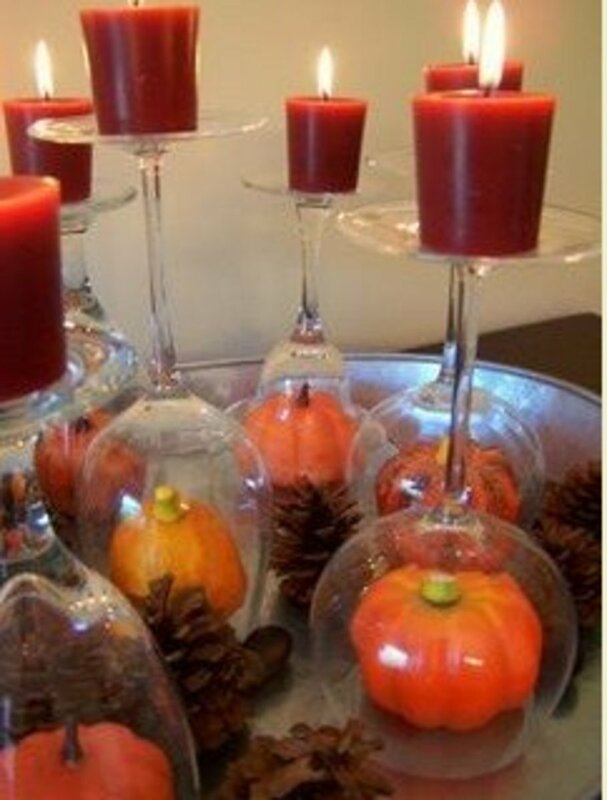 I just love the wine glasses, placed upside down over the mini pumpkins. Very cute! Its a decoration you can use all through the year, just change the pumpkins to something more fitting accordingly to season or holiday. Very well put-together. Voted up and awesome. The centerpieces are beautiful and perfect for Thanksgiving. Gotta love pumpkins and fall colors! These are wonderful ideas. I especially enjoyed the napkin-folding video...I only wish she'd go a little more slowly! Thanks for putting this together, Steph. Voted up and beautiful. So many great ideas here..LOVE them! How clever is the centerpiece with the upside down wine glasses/gobblets with the pumpkins inside!?! Thanks so much for sharing this! Wonderful hub! I really like the upside down wine glass candles and kids table decorations. I too love decorating my table with flowers. 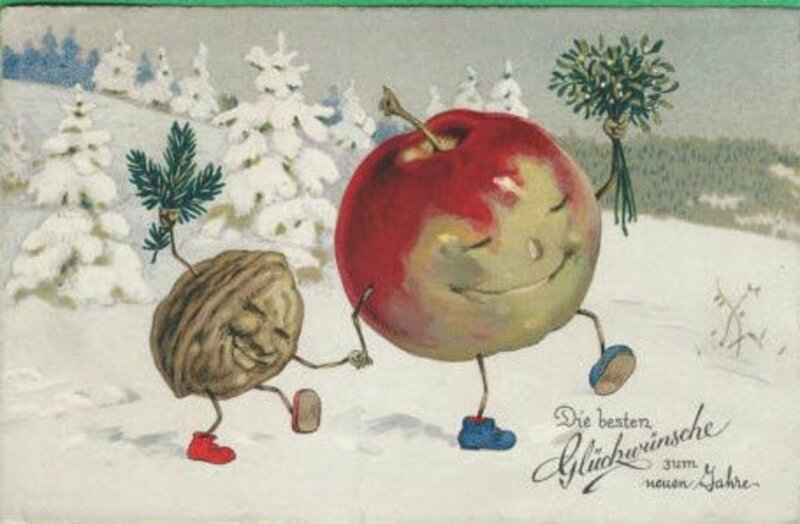 It is right around the corner for those of us in Canada so thanks for the beautiful reminder. This was so beautiful and creative decorations for thanksgiving. 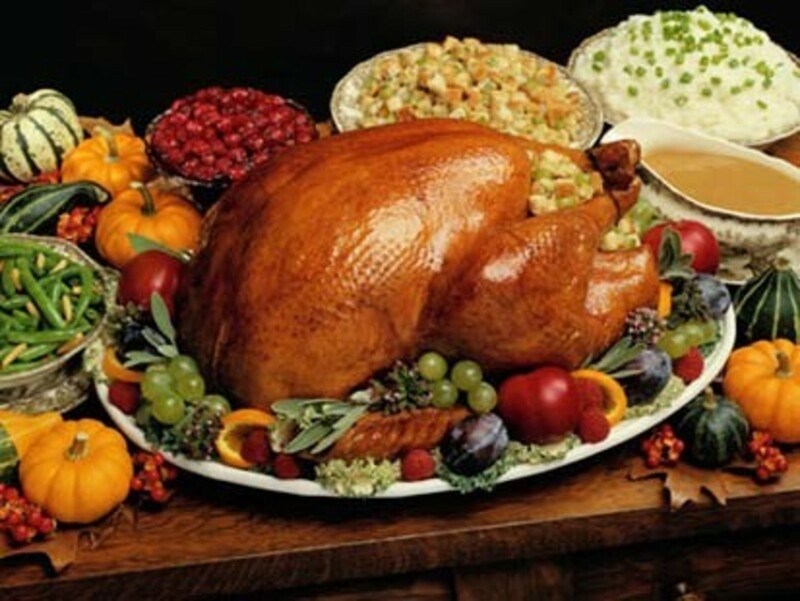 Unfortunately, there's no thanksgiving party in my country. But I really enjoy this hub and feel the aura of thanksgiving by reading this information. Beautiful pictures and video. You have done a great job, Steph. Vote up and have a nice day! What some fabulous ideas here, I especially like the clove oranges and the turkey breadbasket for the kids table. Very neat ideas! I love the one with small pumpkins and upside-down wine glasses. So creatively cute. 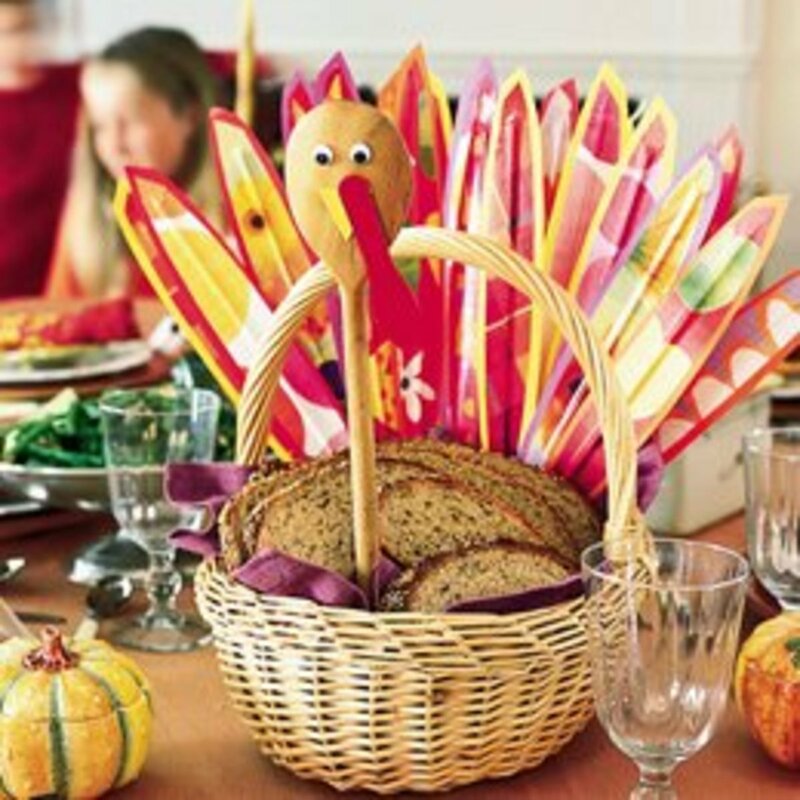 Wonderful ideas Steph, the tips for the childrens table are very good and I love the Turkey bread basket. Voted up, interesting and useful. Great ideas! The turkey bread basket is awesome. One of my favorite things about Thanksgiving is setting the table. It sets the mood for the entire dinner! One idea that I am going to try this year is having a double walled candle holder, they sell one at Pottery Barn, and placing a candle in the center, then in the second layer placing family photos. I'm going to surround this with small votives and gourds that are all placed down the center of the table. Thanks for all of the ideas! A beautiful and so very useful hub. Thanks for sharing and I vote up. I really like many of your ideas here. Thanksgiving in Canada is in October for us so your hub came at a perfect time for me. I especially like the one on the kids' table --very cute and this way they don't feel left out. Thanks Anginwu - I love decorating for the holidays and Thanksgiving is one of my favorite events! Timely tips for Thanksgiving. I always make my own centrepieces for Thanksgiving. I've tried the cranberries one you show on the picture. I filled up a big vase with cranberies and just put a candle in it. Rated up and awesome!